I can’t say for sure, because I am unwilling to spend hours sifting through my archives collecting stats, but I believe that the single home décor topic I belabor most is CURTAINS. I have opinions about where to hang them, which ones to buy, how to make them. It makes sense. Clothes make the man, curtains make the room. They’re not called window dressings for nothing. So I’m STILL working on trying to dress the windows in this apartment. There are tons more windows here than at our old house (which typically just had one large window per room), and they’re all odd sizes and shapes. Because there are so many windows each with their own character, I feel weird dressing ALL of them in long white curtains. Don’t get me wrong, I still adore long white curtains! It just feels too much like I’m dressing them all in matching curtain uniforms. 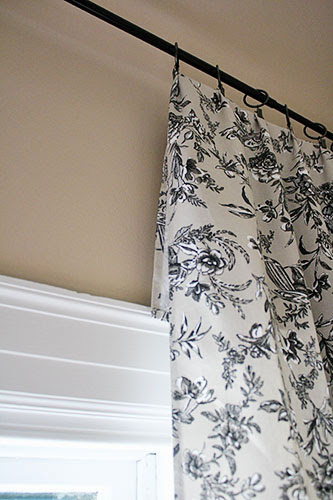 I fixed the curtain-uniform in our master bedroom by adding pelmet boxes over the white-curtained windows, and created a striped shade for the bathroom. But for the single window in the foyer, I totally broke away from the white-curtain mold. So far away that I ignored curtains entirely... in favor of a tablecloth. 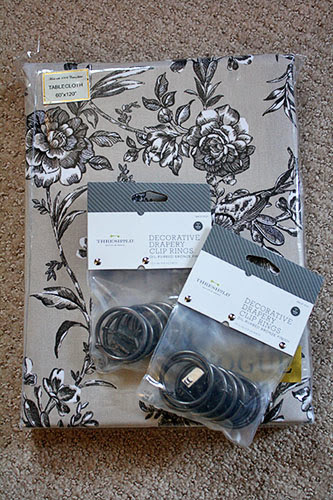 I grabbed ring clips to hang it from Target, and the tablecloth came from HomeGoods. If the print looks familiar, it’s because I’m using its twin to faux-upholster the headboard in the guest room. The print reminded me so much of Dwell Studio’s Vintage Blossom in Dove – which I love, but which is so pricey – that I actually bought two tablecloths, one 60x100” and another 60x120”. I reasoned it was like six-plus yards of lookalike fabric for less than the cost of a yard of the real thing! 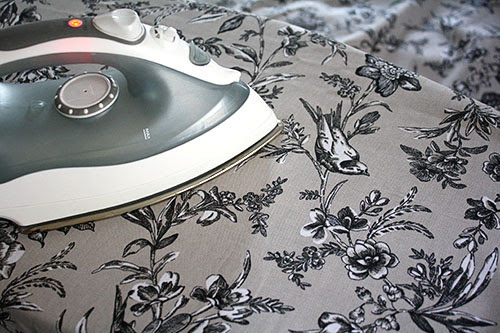 First things first: press out all the wrinkles. ... and CUT. Just cut. No measuring, no hemming. Just cut. Did I bother fixing the cut edge along the side? 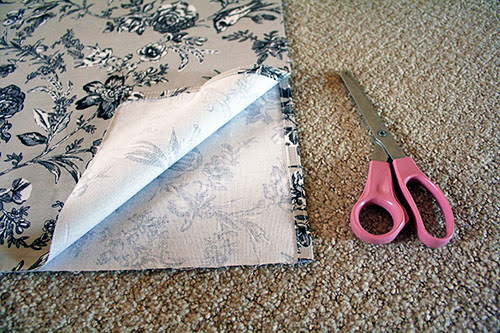 Sewing a hem or using Heat n’ Bond to finish the edge? NOPE. Can you tell the edge is unfinished now that they’re hanging on the wall? NOPE. Normally I’m too meticulous to leave an edge unfinished, but this window has walls on either side. 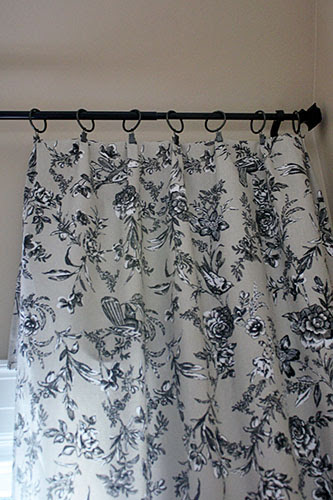 Knowing the outer curtain edges would be flush against the wall, I could not possibly muster the cares given to even iron a hem on those edges. I also couldn’t be bothered to cut or hem my curtain panels to the right length. I figured I could just fold the edges over at the top, where they’d be clipped! SO EASY. 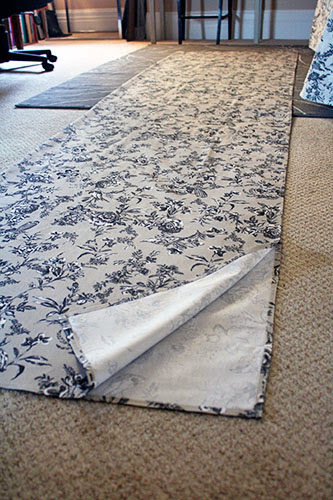 Then my curtain panels were ready to hang! 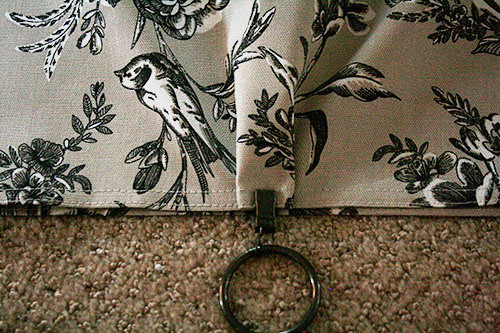 And honestly, the hardest part of hanging these curtains is the part I totally skipped over: hanging the rod. OH EM GEE remind me never to buy a house with plaster walls. They are the WORST. The pretty curtains took nowhere near as long to “make” as the rod did to hang! If you look closely you can see how I folded over the extra length to clip the curtain panels. But... really. No one’s going to look that closely. 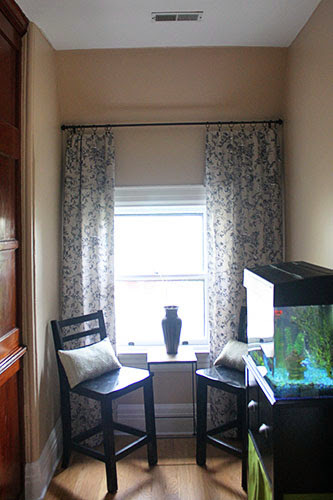 Unfortunately, this window is super off-center, and the curtains sort of accentuate that. But since this is the single window in the darkly-lit foyer, I didn’t want to pull the left-sided curtain over to make the curtains symmetric. Sorry. Just look at that corner obliquely, and it’ll look fine. I’ve already trained myself to look away from the corner straight-on so my eye doesn’t twitch. Nevertheless! I’m still excited about my new pair of Dwell Studio knockoff curtains that took all of an hour to press, cut, and hang. Love the curtains. 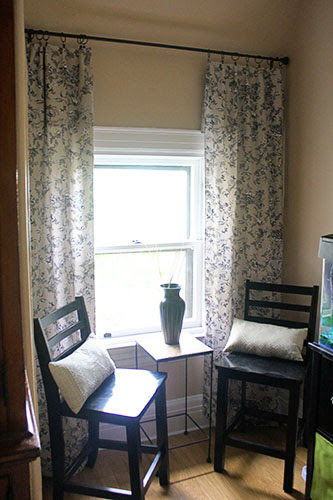 Love the cost ($20 for tablecloth, plus another $20 for the curtain rod and clips). Love how quickly these got up on my wall! 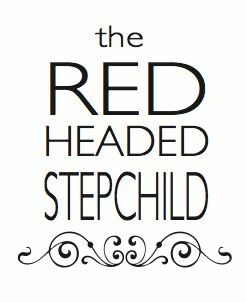 And of course... love how this place feels more like our home every day.